Hill-Sachs Lesion is a traumatic fracture of the humeral head (or ball of the humerus) that leaves an indentation in the bone. This changes the shape of the humeral head and can interfere with normal arm motion. 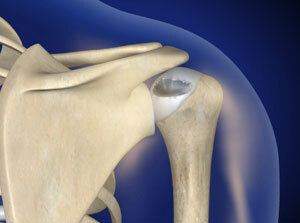 Hill-Sachs Lesion injury occurs when a shoulder dislocates. The ball dislocates out of the shoulder socket to a position in front of the socket. The dislocation leaves an impaction fracture to the back of the ball of the humerus as it rests on the front of the socket. Contact the office of Darren Keiser for more information or to schedule a consultation.